6" center spacer fits Mercruiser small V8, 4.3L and big block V8 applications. Use with 104034, 102979, and 104035 exhaust manifolds. Replaces Mercruiser # 93322, GLM 50600 and Barr MC-20-93322A3. Sold as a set. 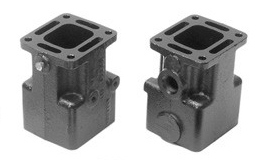 Use mounting kit 3322-MK to mount spacer to manifold. Riser #’s 8503A or 4354 will require their own mounting kit. Save $$$ by purchasing this part as part of an exhaust kit.